Catholic News World : Wow Young Christian Child age 6 in Pakistan - Brings Peace through Social Media : Gabriel the "Peace Boy"
Wow Young Christian Child age 6 in Pakistan - Brings Peace through Social Media : Gabriel the "Peace Boy"
The little Christian boy lives with his parents in Youhanabad, a district in Lahore. He has uploaded videos and images with peace messages on Youtube and Facebook. For his father, "It was amazing to see this little boy speak out for such an important cause". Lahore (AsiaNews) – His name is Gabriel Rojar, a six-year Christian boy who lives with his parents in Youhanabad, a district of Lahore. He is the ‘Peace Boy’ of Pakistan. Despite his tender age, he understands that there is an extreme need for peace and harmony in today's world, which is our common home. For this reason, inspired by comics superheroes like Batman, Spider Man and Iron Man, he decided to create a new superhero and call him ‘Peace Boy’. Since no man of peace has been turned into fictional superhero, he decided to make himself the bearer of a message of peace in the world through videos posted on social media. With his father's help, he created a Facebook page and a Youtube channel dedicated to the superhero. Here he uploads videos and images in which he shares his ideas. ‘Peace Boy’ believes that we should all be like flowers and plants, and not fight each other. All of us must spread the fragrance of peace and make this planet a worthy place for children to live in. He notes that he will never tire of spreading news of peace around the world. Noor Alam Rojar, Gabriel’s father, is proud of his son’s initiative. "It is a pleasure and an honour for me to see that my son has undertaken this great initiative for a good cause. 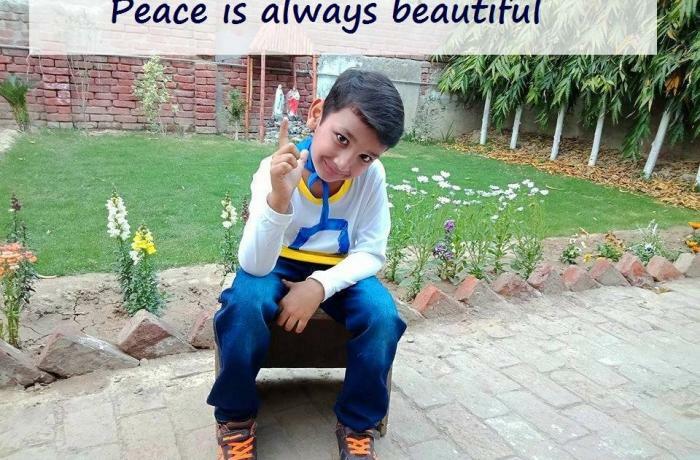 I am proud to be the father of Peace Boy and I hope he can spread the message all over the world. It was amazing to see this little boy speak out for such an important cause. I hope that children, girls and boys, can join him. God bless him!" Here is the interview with Gabriel Rojar. How did you come up with this idea of ​​becoming Peace Boy and who inspired you? I was watching ‘Avengers’ cartoons last year and suddenly I asked my father why there is no Peace Man alongside Spider Man, Super Man, Bat Man, Iron man etc. My father told me that if there is no Peace Man, ‘Why don't you become Peace Man?’ I said, ‘Baba (father), I am not a man, I'm just a kid. Then suddenly I got an idea. If there is no Peace Man, why not Peace Boy. Are you getting any response from your classmates/friends/teachers when they watch your peace videos? Yes, my classmates and teachers and my friends in my neighbourhood really encourage me and say that I am a source of inspiration for them. Being a Christian have you ever faced any criticism from your Muslim friends for being Peace Boy? My father always tells me to think positive even if circumstances are really tough. I did not get any such response from my classmates yet. I am studying at a Christian school where majority of the students are Christians. Did you get this idea from the Gospel, as Christ taught peace, love and togetherness? Do you relate your peace videos to the teaching of Gospel? I always believe that Jesus Christ, who is Prince of Peace, is my role model. We hold family prayers together every day. My parents teach me the Good News and they motivate me to follow in the footsteps of Jesus Christ in my life. What message do you want to send readers in the world through this interview? I want the children in my beautiful country and around the world to join hands with me in spreading the message of peace so that we can build a peaceful and just society and make this world a real Kingdom of heaven!